Jet lag is one of those inevitable disadvantages to traveling. There is no way around it. If you want to see parts of the world that are several time zones away, you will have to suffer from the physical effects of adjusting to the time change. Unfortunately, jet lag in a baby or toddler is even more difficult. Their little bodies don’t understand the time change, and it is harder to get babies to sleep when they become overtired. In fact, jet lag in a baby or toddler can take about 3-4 days. But don’t let that discourage you from traveling during your child’s early years. While baby jet lag is no joke, there are a few things you can do to make the transition easier on your little one. 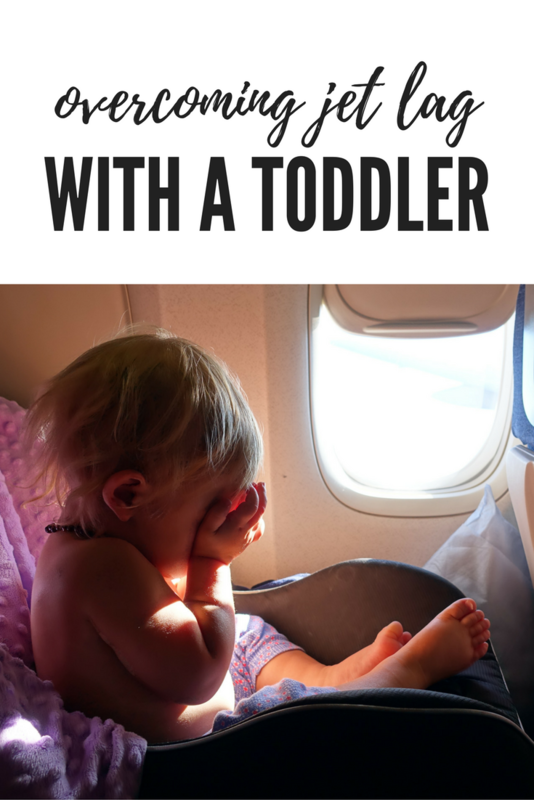 If flying with babies or flying with toddlers, do everything you can during the flight. Pack essential items in your carry-on bag that will keep little ones entertained and relaxed and most importantly help your kids sleep on the flight. 1. Expect a few sleepless nights with your jet lagged baby. You will inevitably be tired and jet lagged yourself, but your little one might struggle to sleep for a few nights. When babies and toddlers become overtired they actually sleep worse. Although your super tired, super cranky baby needs sleep more than anything, he or she will likely sleep much less than usual for a few nights. However, your little one will make up for it later. Expect your jet lagged baby to take longer than usual naps during the day. 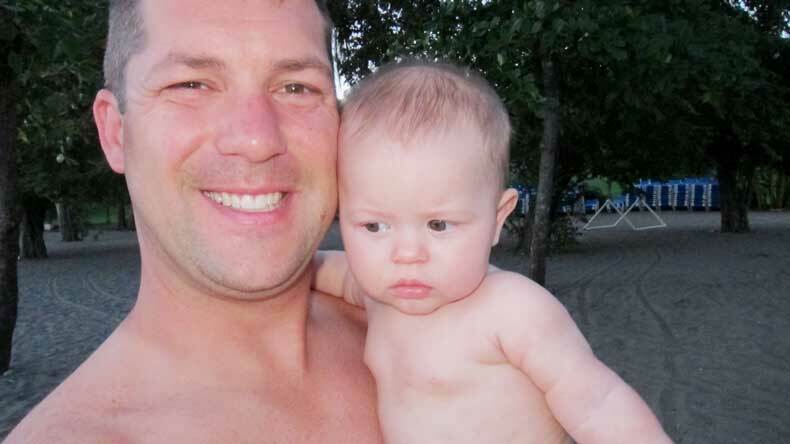 One night during a trip to Europe when our daughter was 19 months old, she slept only 2 1/2 hours. And our first night in Costa Rica when she was just 6 months old, she did not sleep at all. That was brutal! My husband finally walked the beach with her at 4:30am so I could get an hour or so of sleep… just enough to function the next day. The jet lag was hard and exhausting on her and on us too, but we expected it. Sometimes, just knowing what to expect takes away the shock factor and ultimately makes it easier to deal with. If your jet lagged baby or toddler can’t sleep, don’t try to let them cry it out in the crib. If they are happy laying there awake, feel free to let the be. But if they are getting antsy, get up with them. Keep the lights dim and opt for a relaxing activity like reading a book. Be patient. Again, they don’t understand why they are awake. They don’t understand that it is the middle of the night. The time change can be confusing for them, and they need you to be a source of comfort. Often, when we travel a great distance our days started before 5am simply because our daughter won’t sleep any longer. On a positive note, that means we get to visit some of the usually crowded areas before big crowds filled the space. And we are able to snap a few priceless pictures without 4,000 other people in them. 3. Stick to a familiar bedtime routine. When you’re traveling, stick as closely to your child’s bedtime routine as possible. For us, that means selecting a hotel room with a bathtub and giving our daughter a warm bath when it is getting close to bedtime. When our daughter was still an infant, it meant nursing or traveling with expressed breastmilk so she could have her evening bottle. Now that she is a toddler, it means purchasing milk each night so she can have a sippy cup before bed, which we’ve always done at home. It means staying in an apartment or hotel with a refrigerator to keep her milk cool, and bringing her sound machine from home to recreate her typical sleeping environment. All of these things have signaled to our daughter since she was born that it is time to sleep. So sticking to that same routine when we travel helps her to settle into the time change and sleep better at night. When you first arrive at your destination, if it is still daytime, expose your child to daylight. Try to stay outside as much as possible. This helps a child’s internal circadian rhythm adjust to the time change. The fresh air and a little physical activity will also help keep your child awake and distracted. This is especially true with toddlers. 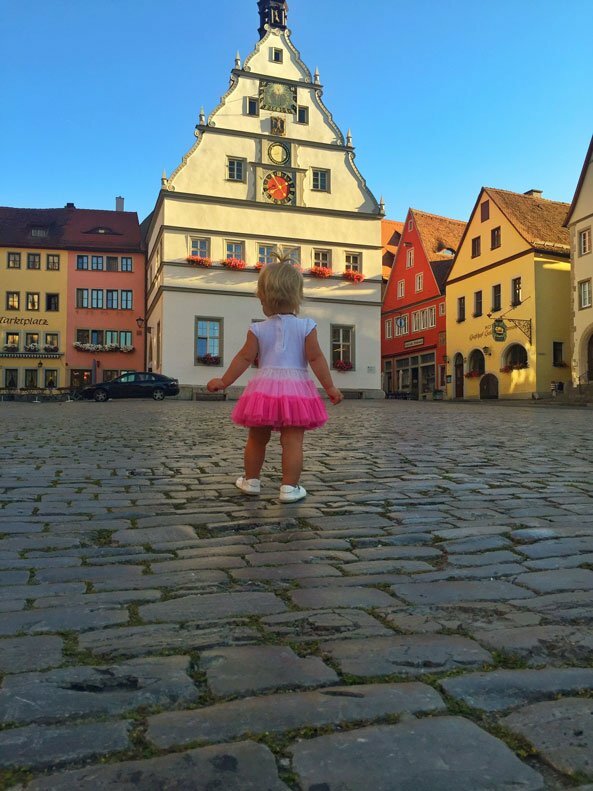 Find a park or even a town square that your little one can run around in and explore. Your baby or toddler may not feel up to it for that long and might even crash in the stroller or fall asleep in your arms. If that happens, there is nothing wrong with calling it a night a few hours early. Again, the most important thing is to just roll with it. 5. Make time for naps – but not too long or too late. Babies and toddlers need at least 14 hours of sleep a day. (Infants require up to 18.) So allow your jet lagged baby time to nap, even if it isn’t their typical nap time. Sleep begets sleep, so napping will definitely help make the transition easier. However, don’t let your baby or toddler sleep too long during the day. A three hour nap is OK, but anything longer than that and you might have trouble getting them to sleep at night. Set an alarm in case you fall asleep, too. Otherwise you may all end up sleeping the entire day away like we did once. You also want to avoid letting your little ones nap too late in the afternoon. Try to keep them up for at least three hours before bedtime to ensure they are tired when it is time to turn in for the night. 6. Pad the front half of your itinerary when traveling. When we travel more than a few hours away from home, we always pad our itinerary with an extra day or two on the front end. This gives us and our jet lagged baby time to recover. We try not to book any tours or have anything big planned on our first full day after we arrive at our destination. The first day should be about relaxing and adjusting. I always worry much more about baby jet lag and toddler jet lag when we are traveling and away from home. Although, jet lag has the same impact on our baby when we return home, it seems easier to deal with and overcome in the comfort of our own house. In fact, usually when we return home, our jet lagged baby typically sleeps more. If that is the case, let them. Their bodies need time to recover from a trip. When you arrive home, let your baby or toddler sleep in or go to bed early if they are showing signs of sleepiness. Traveling with kids is hard. That should go without saying. 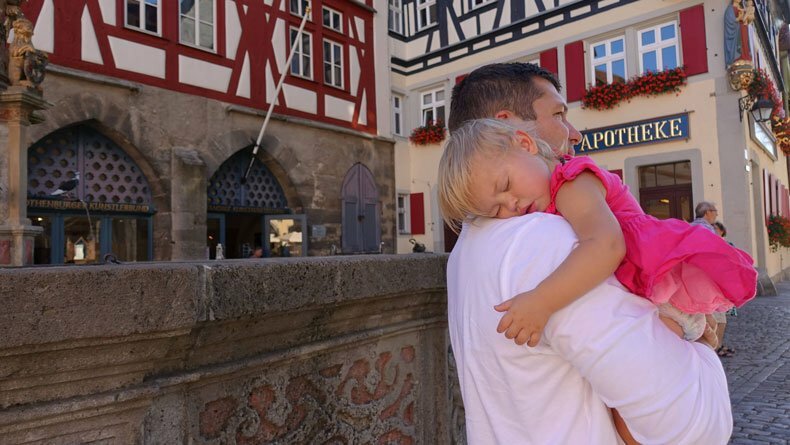 But sometimes as parents, we are so focused on how exhausting traveling with little ones is for us, that we forget how hard it is for them, too. 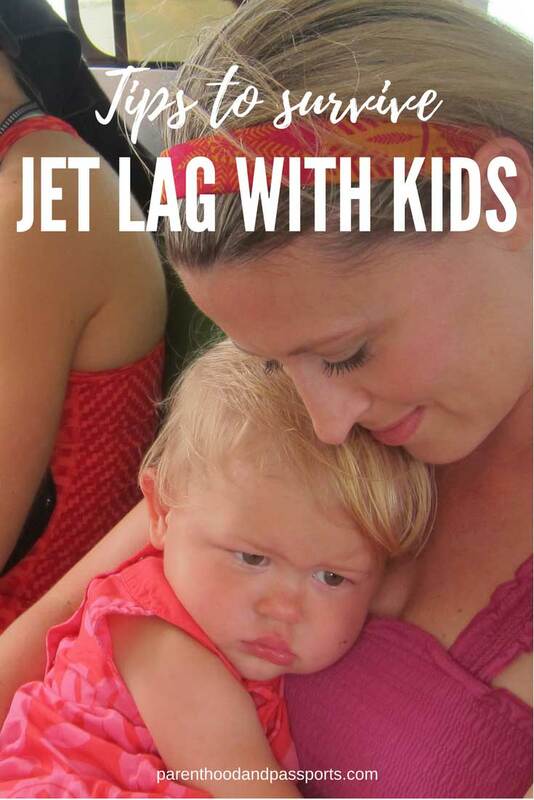 Baby jet lag and toddler jet lag isn’t that much different than jet lag it is for adults. It’s never fun, but ultimately just remember in the moment that showing your little ones the world is worth the momentary exhaustion that comes with the territory. 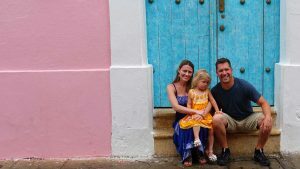 Have a question or comment about overcoming jet lag with a baby or toddler? We’d love to hear from you . Leave your thoughts in the comments below.